PhoinexFlame played this list to a top 3 S-rank finish in October. 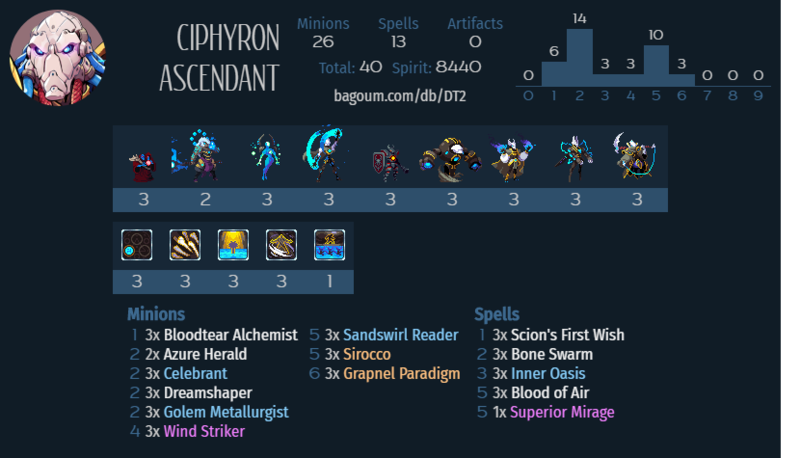 Since seeing the decklist in the Top 50 post, it has become my go-to when it comes to competitive laddering with Vetruvian. It has the tools to handle anything it comes up against, and is very good in the current meta, with favorable matchups against many top-tier decks. In particular, it is quite strong against the most popular general on ladder, Ragnora. This deck wants to take initial control of the board and never let it go. Ciphyron is good for this, as his BBS helps make your minions much more resilient. 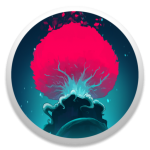 The 2-drop golem package is very strong for Vetruvian early in the game, allowing you to play out multiple bodies while not falling behind on cards. Bloodtear and Bone Swarm are your early removal options to stay ahead, while First Wish provides extra stats that can immediately affect the board. Depending on what you’re up against, your ideal opening play is either Metallurgist to start the golem swarm, or Celebrant to potentially set up for a turn 2 Sandswirl. Midgame, you have access to Vetruvian’s amazing single-target removal options to keep pushing tempo. Try to use Sandswirl Reader before Blood of Air, since the sand tile generates value for the entire game while the Wind Dervish is only for immediate usage. I want to make special mention of Wind Striker, which is good for more than just golem synergies. It plays like a bizzaro Falcius, giving you a lingering attack buff through the Staff, and although it doesn’t provide any healing the 1/4 Flying body is surprisingly useful. Inner Oasis provides an incredible amount of value, and can be a worthwhile play even if you’re only buffing a couple of minions. Winning happens mostly through either outtempoing/outvaluing your opponent and random minion beats, but if you need to close out a game, an Oasis-buffed Sirocco swarm will usually do the trick. Grapnel Paradigm is insane in some matchups – if it can steal multiple minions, that should be enough to win the game on the spot. More typically it will just steal one thing, but is still a huge tempo swing. Azure Herald is good in this portion of the game to keep your life total out of burn range, and if you have enough mana you can bounce it with Sandswirl in the same turn for extra insurance. It seems like no one plays Superior Mirage anymore, which means that no one plays around it any more. Its role is mostly as a silver bullet against Magmar, where it instantly wins games as soon as they drop a Warbeast. It is less useful in other matchups, but can randomly get you value from things like Shadowdancer, Khanuum-Ka, or Kron. General advice is get under slower decks with golem swarm and your damage tools, and go over faster decks with your superior card advantage and sticky minions. Your opponent will prioritize hitting your face over dealing with your board, which means games will end pretty quickly either way. Hence, these matches come down to keeping your distance and using your removal properly. Their minions tend to have low toughness and be clustered up, so Bone Swarm is usually quite effective. Grapnel is amazing in these matchups, since even without using your BBS it is frequently able to steal multiple tokens or a value generator like Sunforge Lancer, Bakezori, Desolator, or Kujata. Sandswirl is worse than usual: the enemy minions tend to be cheap and provide much of their value up front, which make them less desirable to bounce. BBS frequently to save life points. These are the most straightforward matchups. Golems let you get ahead on board early, and since these decks won’t be dropping too many minions per turn, playing out your removal spells on curve goes a long way towards making your tempo advantage insurmountable. Hold onto a Sirocco as a way to rebuild instantly following a board wipe. Here you’re the beatdown, since you need to kill your opponent before their win condition/inevitability kicks in. Stay in their face and look for pings to deal damage and break artifacts, Wind Striker to beat harder, and Oasis to make your minions harder to sweep away. Vaath is a special case because it’s more punishing to exchange general hits and Oasis doesn’t help against Plasma Storm, so trade in your minions for damage whenever possible and hope you can find Mirage at the appropriate time. This is a variation of golem vet that aims to keep the board full and swarm out your opponent to win.